It was Easter Sunday and it was going to be gorgeous out, so I knew we had to go spend some time in the woods, or what I sincerely refer to as “my church”. There is a place down by Farmington, MO that in some areas almost reflects the grandeur and awe that can be inspired by visiting a cathedral, and we hadn’t been there in a couple years, as a family. 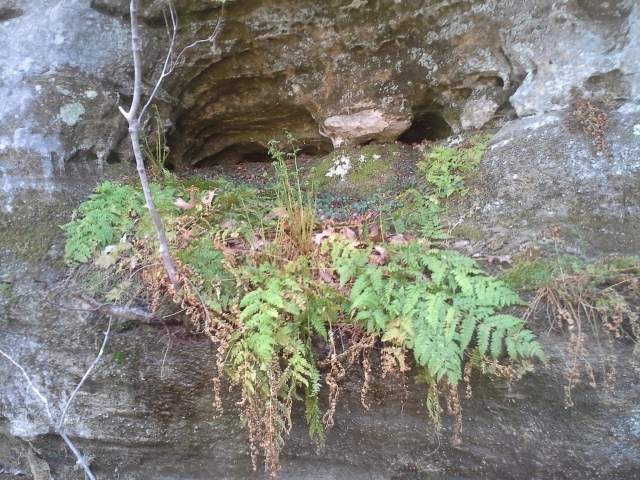 It was the perfect day to go visit Pickle Springs Natural Area, and hike the “Trail Through Time”. 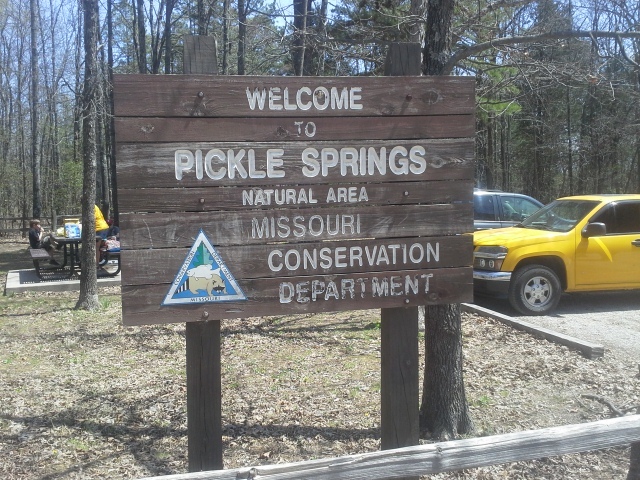 Pickle Springs Natural Area is a block of 180 acres of land managed by the Missouri Department of Conservation. 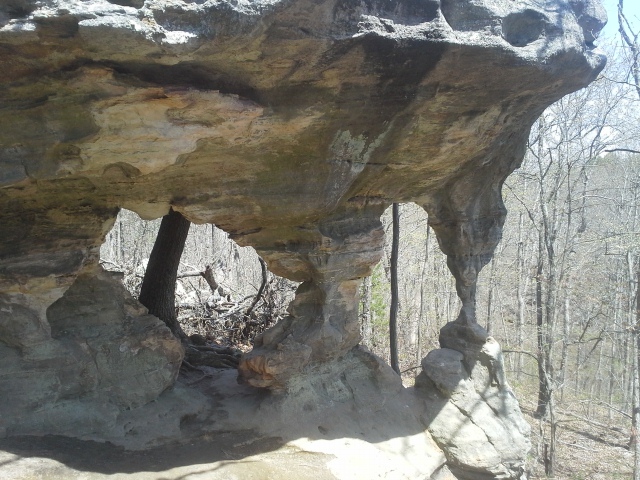 It has a 2 mile loop trail and features quite a bit of cool geological formations to hike around, over, and through. The primary rock that forms the different features is sandstone, and through the course of time and wind and water, it has been carved into different shapes. There is a short canyon to pass through that feels like a cave with the lid removed. There is a set of double arches that is a popular picture spot. There are little waterfalls here and there, and towering walls of exposed rock looming throughout. Pickle Springs is off of Highway 32 between St. Genevieve and Farmington. I find that taking Interstate 55 south tends to get me to 32 faster, but it is closer to the Farmington end of it, so you could take Highway 67 and probably get there in about the same amount of time. From the interchange of 270 and 55, take Interstate 55 south for about 50 miles, until you reach MO-32. Go right (west) on 32 for about 18 miles or so to AA. It will be a left turn (east) onto AA, and after probably not even 2 miles, you make a left turn (north) onto Dorlac Road. About half a mile up on the right is the parking lot and trailhead. There is a lot to look at! 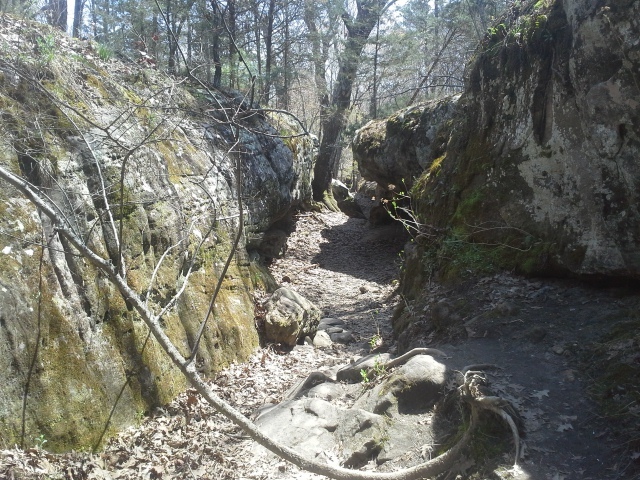 I think for the relatively short length of trail, with all the rock formations and streams trickling through, that this is probably one of the best in Missouri to check out. A lot of bang for the effort invested. It has a multitude of different plant species that apparently are uncommon in other parts of the state. Plants that are referred to as “Glacial Relict Species”, thanks to the micro-climates throughout this area that mimic what the climate was like thousands of years ago. A lot I don’t know about, but pretty cool nonetheless. 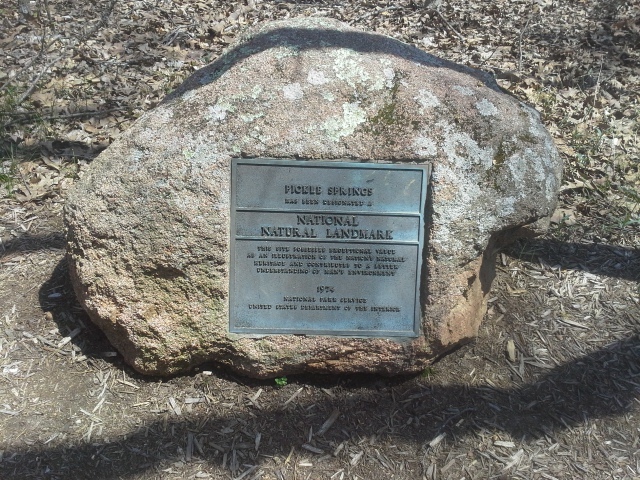 Pickle Springs Natural Area is registered as a National Natural Landmark, and deserves every bit of recognition it receives for its diversity and beauty. This is a bit of a rugged trail, so be warned. There are some good, healthy ups and downs, and some of the rocky areas can have some tall steps. Take some water with you and take the time to see everything. The name Pickle Springs inspires in me some fun place akin to a water park or river resort. As it is a fun place, take care to not disrupt or injure the rock formations or plant life. They are precious and we are lucky to get to see them. This can be a pretty popular trail, so be patient and allow the people in front of you to snap their pictures, and be mindful of those behind you that want to take pictures too. Also, there is a trash can near the beginning of the trail, so please dispose of your garbage in it, instead of along the trail. I first hiked at Pickle Springs Natural Area a number of years ago, and it will forever remain one of my favorite trails in Missouri. Every time we camp at Hawn State Park for a weekend, we make it a point to visit this beautiful area. If you haven’t been there yet, put it at the top of your list. This is one place, that for the amount of trail to hike, you definitely get an overabundance of neat stuff to see. 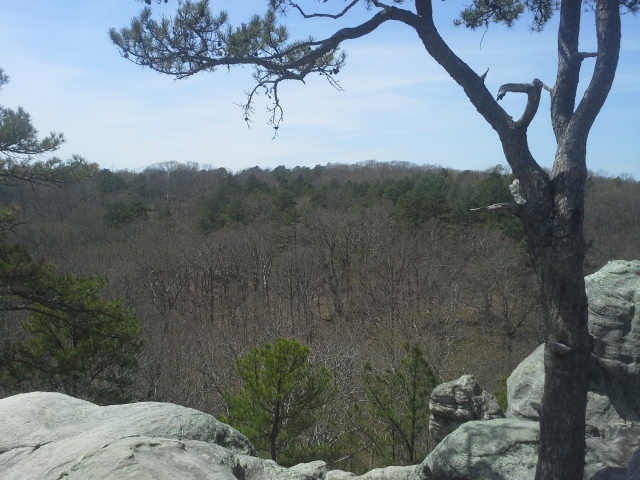 Great hike, our first of MO. Very impressed. Loved the Whispering Pines part too! Well…this might not actually be the trail that you hiked on. The trail in Hawn State Park that connects with the Whispering Pines Trail is actually called the Pickle Creek Trail, and it follows Pickle Creek. That one is a great trail too…but the Pickle Springs Natural Area is actually outside of Hawn State Park, to the southwest in a different area. I haven’t done the research (looked closely at a map), but I think that the waterways are connected somehow. 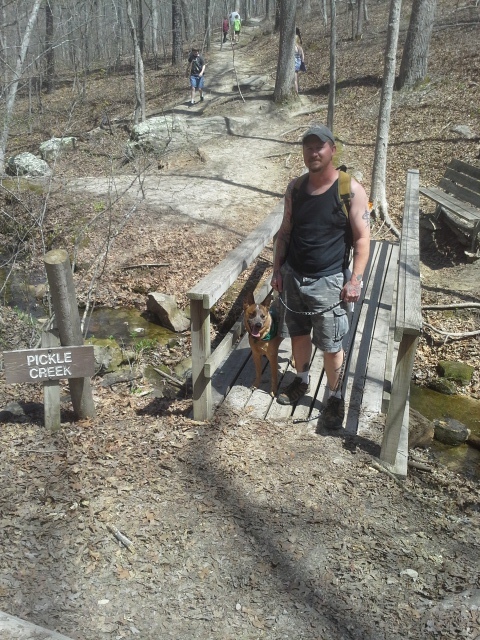 If I am correct in this assumption, make your SECOND hike the Pickle Springs Natural Area.